On the face of it, the Singer S18 looks like a great sewing machine for quilting. You can see by the image that it has that all essential extra throat space needed and conveniently located function buttons. Let’s have a look at the functions and features in more detail. Extra-Large Sewing Space – as already mentioned this machine comes with nearly 9 x 6 ” of space to the right of the needle, giving it the long arm required for managing large projects. Extension Table – this comes included and measures 23” in length by 15” in width. There is also a ruler allowing measurements of up to 18″. Computerized Memory & Editing – you can store up to 50 stitch patterns, retrievable if you turn your machine off. Create unique patterns for your quilting projects. Drop Feed with box feed motion – great for free motion quilting and sewing buttons. The box feed ensures even feeding. for free motion quilting. It also helps you to avoid the dreaded sewing backache! Large Back-Lit LCD Screen – makes it easy to see all the settings and important information, such as the selected mode, recommended settings etc. the light can be adjusted to suit your needs. Specialty Needle Plate – metric and imperial measurements are etched into the plate, which is stainless steel. This helps to keep your seam allowances accurate. There are also angular measurements including 30, 45, 60, 90 and 120 degrees, a great tool for quilting. 400 Built-In Stitches – a good selection of quilting stitches as well as the more common ones. There are also 7 automatic buttonholes and 2 block & script alphabets. 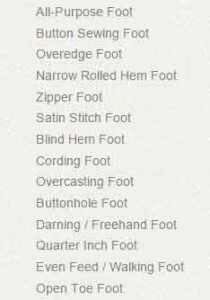 15 needle positions – for all those different tasks like top stitching and inserting zippers. Mirror Imaging, Elongation – a really useful feature for creating unique designs. Stitch Reference Board – a useful removal reference board which attaches to the back of the sewing machine for a visual reference to stitches. 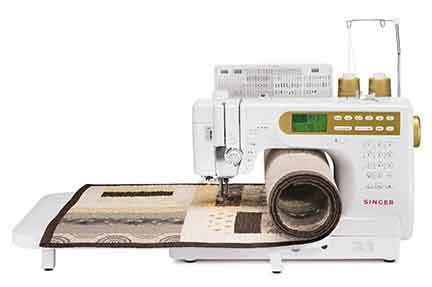 I’ve covered the main features that quilters would need, but the Singer s18 also has the many other features, including and electronic needle threader and top drop-in bobbin. It comes with a good selection of presser feet included with the even feed walking foot, a must have which doesn’t always come included in some machine packages. Watch this video to see how the Singer S18features in action. It’s also a good way of getting a real feel for the size of the machine and how it would fit into your workspace. Doesn’t have PC connection like the Singer Futura xl 400 so not quite as easy to make custom designs. The lack of a free arm could be limiting if you also use your machine for other sewing tasks like cuffs and hems. Quite heavy so not really portable for taking to sewing groups or friends. 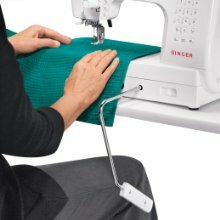 It’s the little refinements in the Singer S18 that I like, the retractable cord on the foot pedal, on the computer screen there’s a contrast button.I also like the independent bobbin winding, you can sew and wind at the same time! The Singer s18 Studio Sewing Machine does what it says on the tin and Amazon reviewers give it a good score. Is it worth the money? At a special offer price yes, it’s worth buying if your budget allows. The extra refinements and stitch quality push it up beyond the budget machines but I wouldn’t pay the full retail price as it is at the time of writing.. A cheaper alternative to look at is the Singer Quantum Stylist 9960. What kind of sewing did you do on the machine Steve? What a great post Kathy! I love this sewing machine, and it looks like a nice little compact style too – great for people like me who live in small houses with very limited available storage space. I actually have a singer sewing machine from a few years ago. I used it for patching up torn clothes and yes guys also know how to use a sewing machine lol. Great review on the Singer S18! Wow, Singer has come a long way since I got my machine many moons ago. I love this one as it really simplifies sewing so anyone could use it. Plus it would definitely make sewing a lot quicker. Like you I love sewing crafts but have not had much chance to do any in a while. I will dig out my old machine and decide whether it is beneficial to purchase a new one and how often I will actually use it. 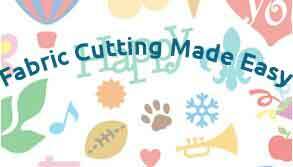 Thank you for this great review it has inspired me to start my sewing crafts again, including quilting. am willing to buy this sewing machine but am not sure about the sewing features i love sewing,,, can we do Applique embroidery on this machine??? Any one knows who already own this machine? I am starting of to sew. A beginner but do not want a beginner machine to then buy another in 6 months. I found this Singer s18 for a good price but do not know if it is the right sewing machine for me. And write names. I want the alphabet on the machine. Is this a machine for fashion or just quilting? I am thankful for someone’s advice.